Are you a South Australian food educator? 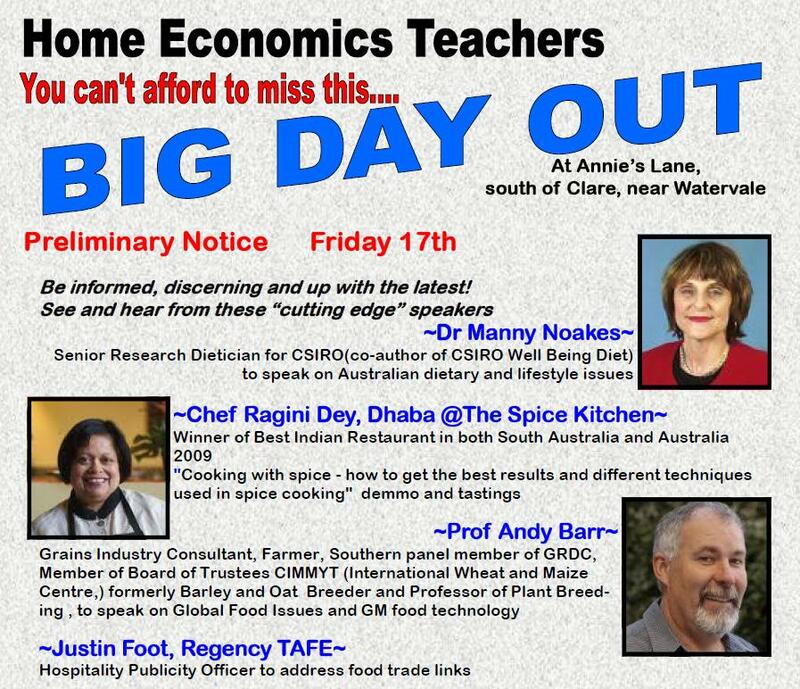 If yes, you need to know about the Home Economics Teachers’ Big Day Out! The conference is being held on Friday 17th September in Watervale (15km south of Clare, 9km north of Auburn) and has an impressive list of speakers and presenters. Celebrate spring – free recipe! Spring has arrived and to celebrate here is a lovely and simple pavlova recipe which will also give you the opportunity to use those early spring mangoes which are starting to arrive. Adding vinegar and cream of tartar to the meringue mixture helps give pavlova a crisp crust and marshmallow centre. A range of other ingredients can be used to decorate it, including peeled, sliced kiwifruit, banana slices, fresh berries, grated chocolate and finely chopped Cherry Ripe or Peppermint Crisp bars.